You generally need a visa to enter Kenya. However, citizens of certain countries can visit Kenya for up to three months without a visa. This is generally extended to African, Caribbean and a few European and Asian States. Citizens of European Union nations and US require a travel visa to visit Kenya. 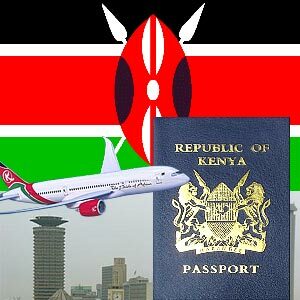 A Kenyan travel visa can be obtained upon arrival at the airport especially if you are a citizen of the United Kingdom. Nevertheless, it is advisable to obtain the visa from the Kenyan consulate or embassies in your region before arriving. A travel visa to Kenya allows you to tour the country. You can obtain either a single or multiple entry travel visa that would suit your visiting purposes. A single entry travel visa would suffice if you plan to visit just Kenya alone. However, if you intend to visit East Africa (Tanzania, Uganda, Mount Kilimanjaro or Zanzibar) then you might need a multiple entry travel visa. If you have a multiple entry visa, ensure to collect your 'Visitor Pass' upon arrival at the Kenyan Airport. The visitor pass permits you to re-enter Kenya free of cost, if you are traveling within East Africa. Single entry travel visa to Kenya is generally valid for a period of six months. If you are from US, a copy of the Resident alien card (front and back) or a valid visa back to the US must be enclosed. If you hail from other countries then a valid round trip ticket or letter from your travel agent describing your travel plans/itinerary should be enclosed. If you travel to Kenya directly from Europe or the US then no immunization is required to enter the country. However, if you travel from a country where yellow fever is present, then proof of your vaccine must be provided to the consulate of Kenya along with the visa application. It is recommended to carry or consume anti-malarial prevention medications, if intend to visit tropical regions. If you have submitted the visa in person, then the processing of the same may take four business days. Rush services and immediate walk-ins are processed in one day. If you have applied through mail, your visa process may take up to 10 business days or more.